For the past two weeks we have been looking at the Top Nine VBS resources for 2015, but today is all about the VBS which came out as my Top Pick for 2015! I have been waiting to see what Standard did with their VBS this year with the theme, "Bible Blast to the Past" (which is my Top Pick for Setting for 2015) and I am happy to say Standard does not disappoint! They have designed a resource which solidly teaches God's Word by engaging children in fun and unique activities! Message – Standard says, "Children will KNOW what God's love is, EXPLORE God's everlasting love and SERVE God by loving others." I'm very happy to see a strong focus on evangelism in each lesson - each teacher's resource includes information on how to lead children to Jesus! The Bible lessons are very engaging - the lessons have children opening their Bibles, reading verses and looking in their Bibles to find out what happened - excellent! Activity for children to be engaged from the time they arrive at their Bible adventure until they leave! I'm very happy to see volunteers encouraged over and over to remember to pray for the children participating in their VBS! "Missions Quest Cave" is excellent and, "Helps kids find out living is an every-day adventure - with challenges to serve in their own communities and around the world! Every kid will have the opportunity to participate in practical service and missions projects designed for all ages. Whole churches will be jumping in to do service with a lasting purpose!" I LOVE the daily "Service Challenge" which gives children several practical and do-able ways they can live what they learned. I also LOVE the daily "Service Journal" which gives children space to record what they did, when they did it, what happened and if they will do it again! EXCELLENT! "Special Needs Tips" throughout to help leaders, teachers and helpers know how to engage and involve children with special needs in every part of the VBS! Excellent! Complete section in the Director's Guide on helping and involving children with special needs! NEW THIS YEAR - "Discovery Ruins" engages children in science projects and crafts to help children learn and, "discover even more about God's everlasting love!" Includes an abundance of snack ideas - many, many are healthy and tasty! - and lots of game ideas! I especially love the “guided conversation” and “Crew Review” for the small group leaders and station leaders each day to help kids focus on God’s Word and how it lives in their everyday lives! I love the “Intro Activities” for each day’s Bible lessons – gets kids engaged and thinking! I LOVE the "Point to Jesus" at the end of each lesson - excellent! worshipping Him! However; I’d like to see children on the DVD rather than teens. FLOPPETS return again this year - children will be very happy to see the daily Blast to the Past Bible Pals Floppets and be reminded of the daily points! I LOVE the Large Group Game played by all the children each day in the Opening! Starts the day on a fun note, builds enthusiasm and introduces the point for the day! Daily Closing is a great way to end the day with a challenge to children to go home and serve others! Closing would be a great place to add more Science Projects! Director's Guide is complete - excellent safety info - and I LOVE the info on involving families, reaching out to families and following up with families! Also has excellent tips for outreach and Spiritual growth! Great music with Yancy - kids will love the songs! With the exception of the last two songs, most of the kids in the music video are white, teen girls. I'd really like to see the music video have more children - not teens - from more races. 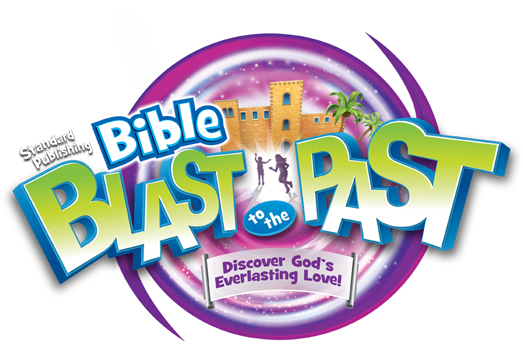 Standard says, "Bible Blast to the Past will take your kids on an amazing time-travel journey to experience adventures which show the INCREDIBLE, FAITHFUL, INVINCIBLE, UNCONDITIONAL and REAL love of God. Kids will know they can count on God's love because God IS love (I John 4:16)! Kids' lives will be changed and they will be inspired to courageously change lives around them." I love the focus in each lesson and each station on pointing children to God's love and challenging them to take what they learned out the doors of the church to live it in their everyday lives, every day by serving others. Bible Blast to the Past not only shows all the design, creativity and thought Standard Publishing put into writing it to engage children, but it also shows great prayer and focus on teaching God's Word were also priorities for Standard. It is clear they want to use Bible Blast to the Past as a resource which is not only fun, but one which helps children Know God's love and then challenge them to Explore and Serve! The Christian life is not just a one-moment-in-time event; it is the start of a life of learning and exploring Who God is, how we can know and walk with Him and then serving Him. Standard does an excellent job of keeping this in focus with their balanced and excellent VBS. From the time children arrive to when they head home each day, children at Bible Blast to the Past will be engaged in God's Word; not just having fun, although there will be plenty of fun to be had! Definitely find a way to use Bible Blast to the Past in your ministry! One thing that made ke not pick it even though I love the theme is that we were looking for mixed age materials. You could combine ages however you want and use the 3rd/4th grade or 1st/2nd grade Bible lesson. I've done this before and it works quite well. I retired a few years ago after 35 yrs. in education. I have always been fascinated at the mind God gave all of us and how it has the potential for ANYTHING with prayer and hard work. I had always thought that "after I retired" I would like to revamp, upgrade, improve our church's children's Bible curriculum. My husband and I are being blessed every day the past three years as we work as volunteers on the children's Bible curriculum, from writing, creating beautiful visuals that can be used year after year, to teaching twice a week in the grade level I have just completed. My husband was diagnosed with a rare form of leukemia four years ago, will have to take chemo the rest of his life, but it is working. We feel so blessed to have the opportunity to see our dream come true with developing good, reusable Bible lessons for the precious little souls at our church! THANK YOU for the information on Blast from the Past. My head is spinning with ideas to add to all of yours as well as fun decorations for VBS. I have just become a follower of your materials and they are FABULOUS. Thank you for what you are doing to promote children's love of the Word and to help us impart our faith to them! I'm so glad I found your review. Its been nerve wrecking trying to decide which curriculum to use. I keep returning to the different sites and reviewing the material over and over again. I am happy to see my top three choices in your top ten. Still not certain yet. I really want to do something different than all the churches in my area. My church hasn't done VBS in two years and I am excited but nervous too. Which do you suggest for a rough urban area?